Using the same rationales, we have prepared and tested another set of multidentate catechol (Dopamine)- and polyethylene glycol (PEG)-derivatized oligomers, OligoPEG-Dopa. These OligoPEG-Dopa ligands promote enhanced affinity to iron oxide nanocrystals. As for QDs above, the ligands consist of a short backbone laterally appended with several catechol anchoring groups and several terminally-functionalized PEG moieties to promote affinity to aqueous media and to allow further coupling to target molecules (bio and others). The ability of these catechol-functionalized oligomers to impart long term colloidal stability to the nanoparticles is compared to other control ligands, namely oligomers presenting several carboxyl groups, and monodentate ligands presenting either one catechol or one carboxyl group. 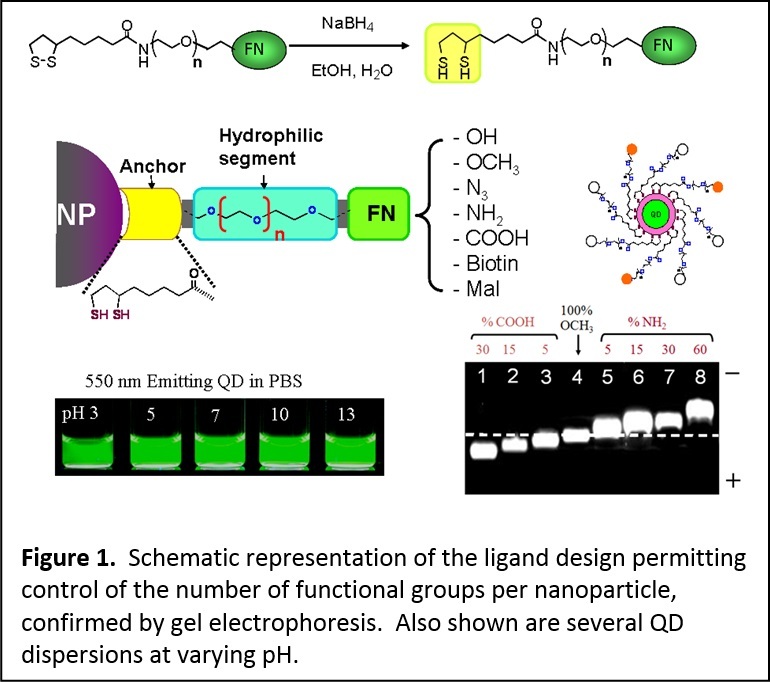 Overall, we found that the OligoPEG-Dopa ligands provide rapid ligand exchange and the resulting nanoparticles exhibit greatly enhanced colloidal stability over a broad pH range and in the presence of excess electrolytes; stability is notably improved compared to non-catechol presenting molecular or oligomer ligands (Figure 4). By inserting controllable fractions of azide-terminated PEG moieties, the nanoparticles (NPs) become reactive to complementary functionalities via azide-alkyne cycloaddition (Click), which opens up the possibility of biological targeting such stable NPs. We also measured the MRI T2 contrast of the OligoPEG-capped Fe3O4 nanoparticles and applied MTT (3-(4,5-dimethylthiazol-2-yl)-2,5-diphenyltetrazolium bromide) to test the potential cytotoxicity of these NPs to live cells; we found no measurable toxicity to live cells. The above oligomer design allows easy reactions with target molecules (bio and such) for further functionalization of the nanocrystals. For example, starting with amine-modified OligoPEG-DHLA-QDs, we applied maleimide to cysteine coupling to attached specific peptides (see area 3); amines were modified to maleimide using NHS-Maleimide linker. Similarly, we applied “Click” chemistry to assemble several copies of alkyne-modified dyes onto azide-presenting Fe3O4 nanoparticles capped with OligoPEG-dopa. (ACS Nano 2012, 6, 389–399. DOI: 10.1021/nn203735b) We have also been developing robust coupling chemistries to assemble various proteins, peptides and other biological systems onto the surface functionalized nanoparticles outlined above (see area 3). Photo-Induced Phase Transfer of Luminescent Quantum Dots to Polar and Aqueous Media. 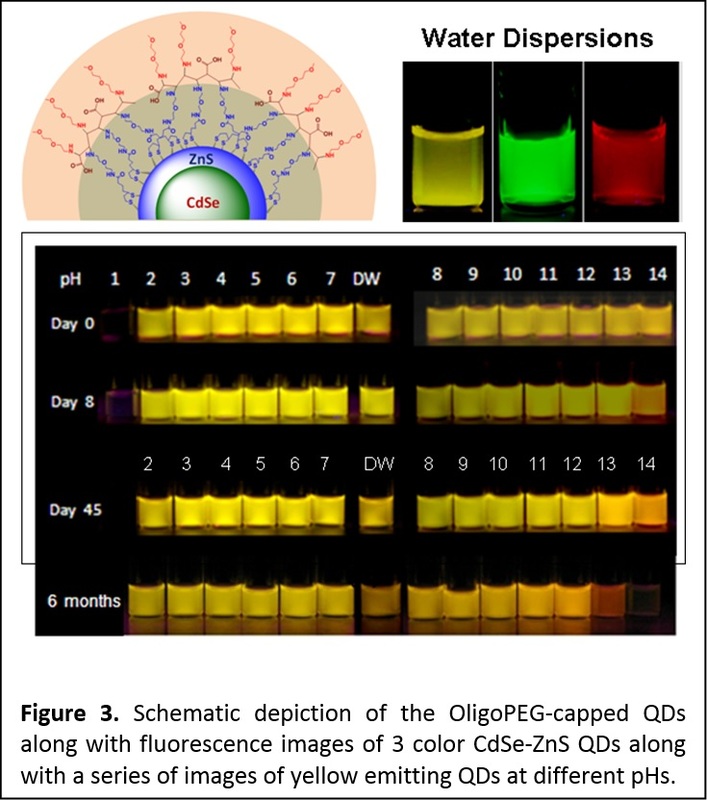 We have developed a new, effective and simple to implement photo-mediated strategy for the phase transfer of luminescent quantum dots and potentially other inorganic nanocrystals, from hydrophobic solutions to polar and hydrophilic media; this strategy is effective and simple to implement. 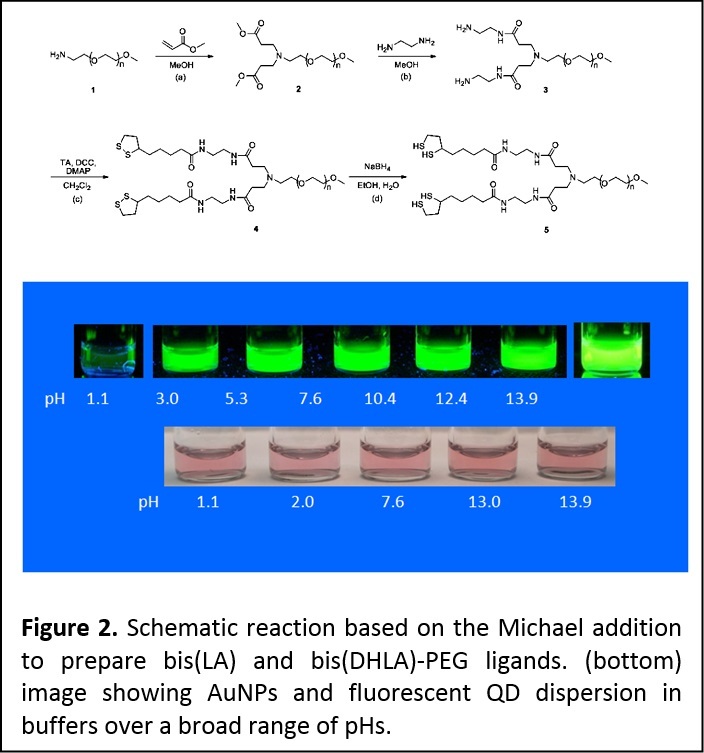 In particular, we demonstrate that UV-irradiation (λ < 400 nm) promotes the in-situ ligand exchange on hydrophobic CdSe QDs with lipoic acid (LA)-based ligands and their facile QD transfer to polar solvents and buffer media (Figure 6). This convenient method obviates the need to use highly reactive agents for chemical reduction of the dithiolane groups on the ligands. 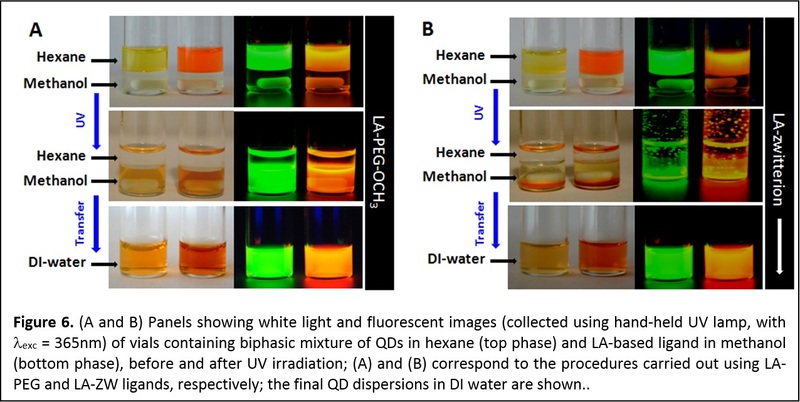 It maintains the optical and spectroscopic properties of the QDs, while providing high photoluminescence yield and robust colloidal stability in various biologically-relevant conditions. Furthermore, development of this technique significantly simplifies the preparation and purification of QDs with sensitive functionalities such as azide or aldehyde (J. Am. Chem. Soc. 2012, 134, 16370–16378. DOI: 10.1021/ja306621n). Multidentate and Zwitterionic-appended Ligands Provide Compact and Biocompatible Quantum Dots. 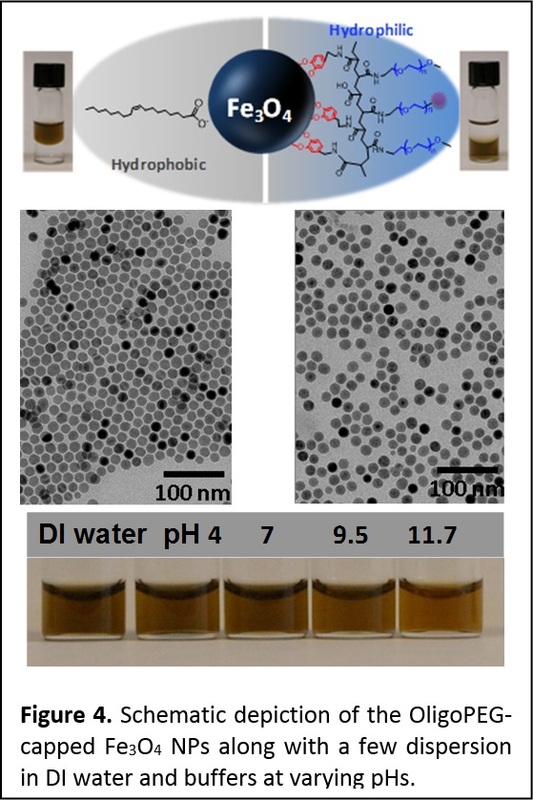 Hydrophilic and functional semiconductor nanocrystals that are stable at very small concentrations and under ambient conditions (room temperature and light exposure) and compact provide greatly promising for use in bio-inspired applications. We designed a set of metal coordinating ligands where we combined one or two lipoic acid groups (as a multi-coordinating anchor) with a zwitterion group for water compatibility (Figure 7). These ligands were combined with the new photoligation strategy (introduced above) to promote the transfer of CdSe-ZnS QDs to buffer media. 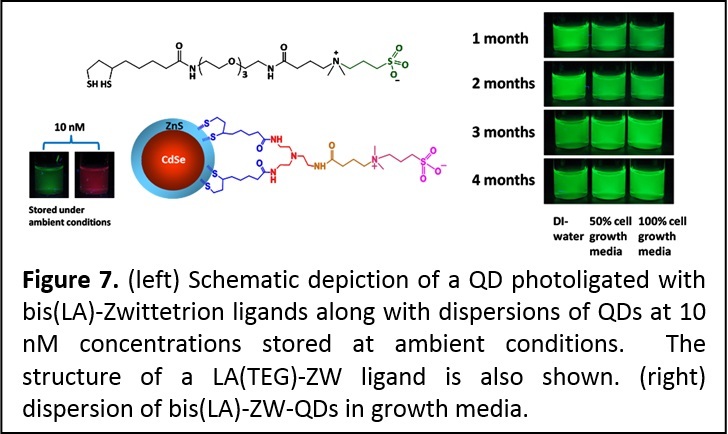 In particular, we found that the QDs photoligated with this zwitterion-terminated bis(lipoic) acid exhibit great colloidal stability over a wide range of pHs, to excess of electrolytes, in the presence of growth media and reducing agents. These QDs are also stable at nano-molar concentrations and under ambient conditions (room temperature and white light exposure), a very promising property for fluorescent labeling in biology. In addition, the compact ligands permitted the metal-histidine self-assembly between QDs photoligated with bis(LA)-ZW and two different His-tagged proteins (see area 3). The remarkable stability of these QDs combined with the compatibility with metal-histidine conjugation, are greatly useful for applications, ranging from protein tracking and ligand-receptor binding to intracellular sensing using energy transfer interactions (ACS Applied Mater. Interfaces 2013, 5, 2861−2869. DOI: 10.1021/am302788q; J. Am. Chem. Soc. 2013, 135, 13786-13795. DOI: 10.1021/ja405010v). 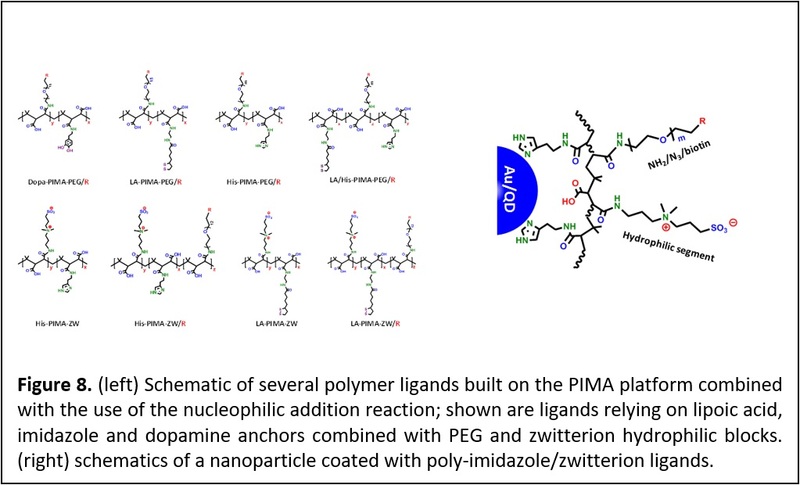 Development of PEG and Zwitterion-appended Polymer Ligands. Controlling the interactions between nanoparticles and biological systems is essential for the effective use of these materials in imaging, sensing, and delivery applications. Such control depends, to a large extent, on one’s ability to conjugate those materials to target molecules. Equally important is the long term colloidal stability and the overall hydrodynamic dimensions of the nanocrystals in biological media. 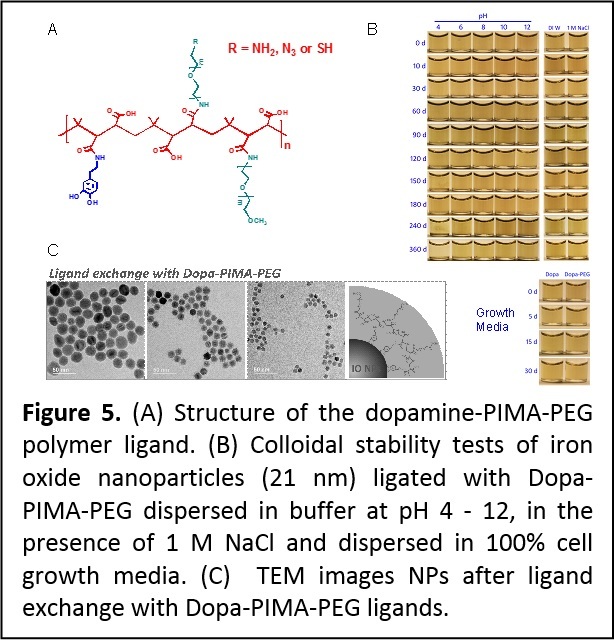 We have developed a new set of polymers as multifunctional, metal-coordinating ligands ideally adapted to surface functionalize QDs, iron oxide nanoparticles and gold nanoparticles/nanorods. The ligand design relies on the introduction of multiple anchoring groups, hydrophilic moieties and reactive functionalities into a polymer chain, via one-step nucleophilic addition reaction (Figure 8). This surface functionalization route yields nanocrystals that exhibit long-term colloidal stability over a broad range of biological conditions, such as pH changes and when mixed with growth media, while preventing corona formation. When zwitterion groups are used as the hydrophilic blocks (instead of PEG), this provides compact nanocrystals that are compatible with conjugation to proteins promoted by metal-to-polyhistidine self-assembly. The facile introduction of amine-containing molecules in the reaction permitted in-situ functionalization of the polymer ligands with an array of reactive groups (carboxylic acid, amine, azide, and biotin). This facilitates the subsequent assembly of nanoparticle with biomolecule using different bio-orthogonal coupling chemistries. Furthermore, this synthesis route has allowed the insertion of target biomolecules in-situ (during ligand synthesis). This allows combining hydrophilic modification and bioconjugation of the QDs in one step. The platforms prepared using this coating strategy have a great potential for use in a variety of biological applications such as fluorescence imaging of tissue and cells, and improving magnetic contrast imaging (Faraday Discussions 2014, 175, 137–151. DOI: 10.1039/c4fd00154k; J. Am. Chem. Soc., 2015, 137, 16084−16097. DOI: 10.1021/jacs.5b10359; J. Am. Chem. Soc. 2015, 137, 14158–14172. DOI: 10.1021/jacs.5b08915.